A best-in-class, turnkey GRC solution up and running in weeks. OXIAL GRC SOLUTION: EXPRESS is ideal to quickly getting off spreadsheets. challenge for boards, executives, as well as the governance, risk management, and compliance (GRC) functions throughout the business. That’s why we recommend OXIAL GRC EXPRESS for those who need a solution that is quick to implement, easy to use and to do maintenance on. Access: having access to a full intuitive web and mobile solution is the first and most visual gain after launch. 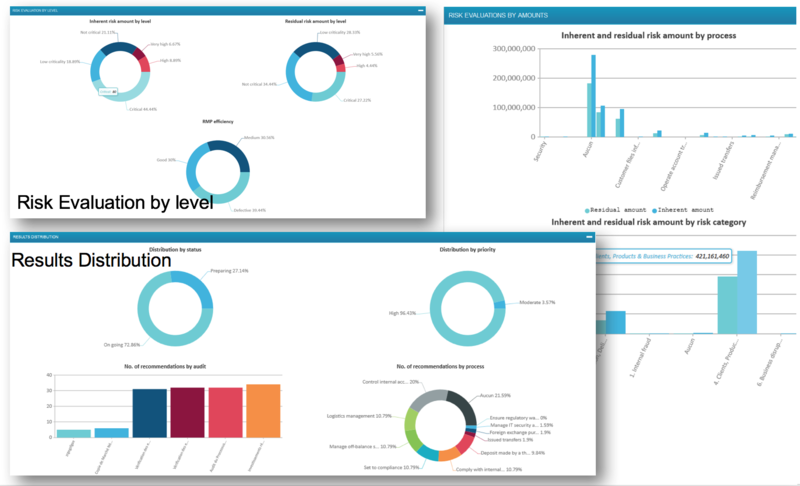 Additionally, real time dashboards and best practice reports that work out of the box are are available. The way it saves implementation time is that it has all the functionality for best practice GRC operations already built in, together with dynamically linked elements, ensuring immediate adaptation to organisational change. Specially designed with Internal Audit, Compliance, Audit and Risk Management departments, focused on a quick to implement approach, for either the Financial Services or Insurance Industry. It allows quantitative and qualitative measurement of the risks and their financial impact, thus reducing human errors, fraud, or quality issues. 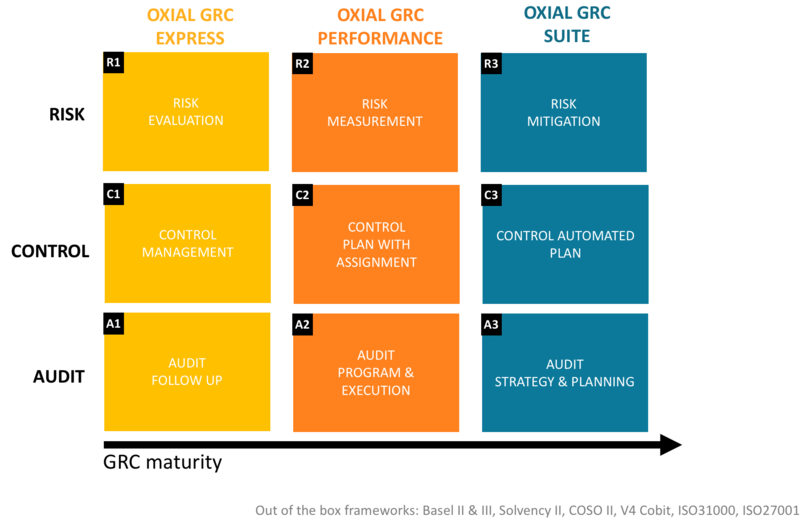 OXIAL GRC EXPRESS is GRC in a nutshell, providing all the main GRC functionality combined on a single platform. Designed for customers looking for a standard solution with preloaded referentials and all of the commonly-needed functionality for risk, control and audit. Implementing GRC Express is effortless as workflow and risk analytics are already built in. • Gives your organisation a real-time and integrated view of all risks. • Establishes a common taxonomy across the company via the shared libraries of definitions. • Harmonises controls reducing duplication of effort and overheads. • Measures and quantifies risks, informing decisions regarding risk transfer and insurance. • Provides guidance from end-to-end on how to manage related risks control and audits. • Integrates with the overall risk and compliance structures within the enterprise. • Generate up to 70% saving in time and effort when using existing tools to address business risks. • Reduces the control workload by 25% and also the control incidents by up to 70%. Highlights of coverage. For the complete list or demo, please contact us.